Spring has sprung and I think everyone two footed and four pawed is celebrating. After a snowy, cold winter our thoughts are now aimed at summer fun. 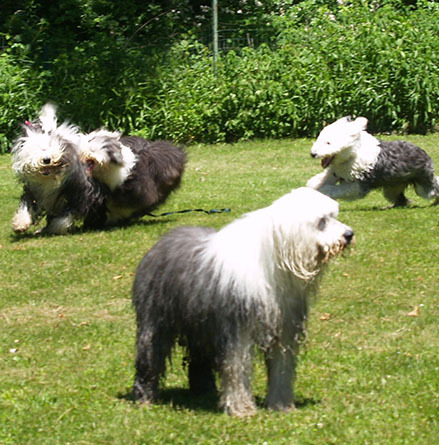 Of course, for Old English Sheepdogs there is no greater fun then the June NEOESR picnic. Preparation is underway for another “day in paradise” at the former Bancroft Estate in Lebanon, Connecticut. It will be fun in the sun with a catered picnic lunch and a huge fenced in area along with a pond to swim in. The tent will be erected, the auction items will be the best and multiple OES merchandise will be for sale. If you haven’t done so already, make sure you order your NEOESR 2018 picnic tee shirt on ebay. Again, it is the best one we have ever had and put a huge smile on every board members face. This year we will be having registration so check the website for updates. Our rescue has been very busy. The amount of dogs entering NEOESR has been growing and the placement team lead by Jennifer Tyrell and back ended by the famous Grannie Annie have been hard at work. We have been rescuing dogs young and old. In addition, to taking in dogs and placing them in wonderful homes, we have also been working and advising with people who have reached out for help to overcome issues with their OES’s. We have been helping to keep their OES’s in their original homes empowered by more knowledge of the breed and greater understanding of what it takes to keep everyone happy and living in harmony. Additionally, we have been reaching out to other organizations and referencing other rescues where applicable to help our beloved sheepdogs on several levels. There are many ways to rescue and we have been aiding in all these areas. Our Visionary Committee has been continuing to refine plans for presenting a resource guide for owners Of our senior dogs. Resources have been identified and the guide is in review. So keep a close watch for this wealth of information. More and more people are “liking” us on Facebook and our social media footprint has been expanding. Thank you to everyone who helps us on this platform.! Merchandise continues to thrive, and we continue to offer unique one of a kind offerings on ebay. So keep NEOESR in your favorites list and check frequently. Financially, we are a sound non profit with our aim being to assure that every possible dollar go toward the welfare of our rescued OES’s in one form or another. Our donors make it possible to what we do. They enable us to rescue dozens of OES’s a year in multiple ways, bring smiles to many people’s faces, and to keep you fully informed of all that we do. Our entire organization is grateful to all the generous folks out there who help us. Thank you so much!! As always, I would like to thank all the NEOESR volunteers who give so many hours dedicated to our rescue. You are making a huge difference. Have a great spring and let’s hope that the weather will soon warm so we have the best sun in the fun picnic to date.. I’m looking forward to seeing you there! !